Cut out two black circles for the eyeglass frames (max size of paper), two white circles for the eyes, two brown circles for the irises, and two black circles for the pupils. I recommend tracing big pans or containers for the circles (instead of freehand cutting...which I tried first and came out terrible) since the circle eyes are such a defining feature. Also cut two strips (about 3 x 8.5 inches) for the eyeglass stems. Pick your favorite minion mouth (we referred to a roll of minion duct tape for imagery). I freehand cut a set of teeth, glued it to black paper and then freehand cut a mouth shape. Measure your door and cut several large sheets the width of your door (for our door we needed five 20 x 36 inch sheets). Then cut these sheets in half lengthwise on an angle (perfection not encouraged!). Tape the strips together, lining up the straight (uncut) edges parallel; you are now working on the back of the mummy wrap -- the flip side will show the uneven angles. We taped 3 strips for the section above the glasses and 7 strips for the section under the glasses. Flip the strips right side up and insert some rolled tape pieces into any overlapping paper sections that are gaping a lot, but don't seal the seams shut. You want it to look imperfect so it looks like mummy wrap. To add a little more color pop, cut shards of yellow and insert/tape them along irregular edges. Measure and cut out holes for your door hardware (e.g., knob, deadbolt). 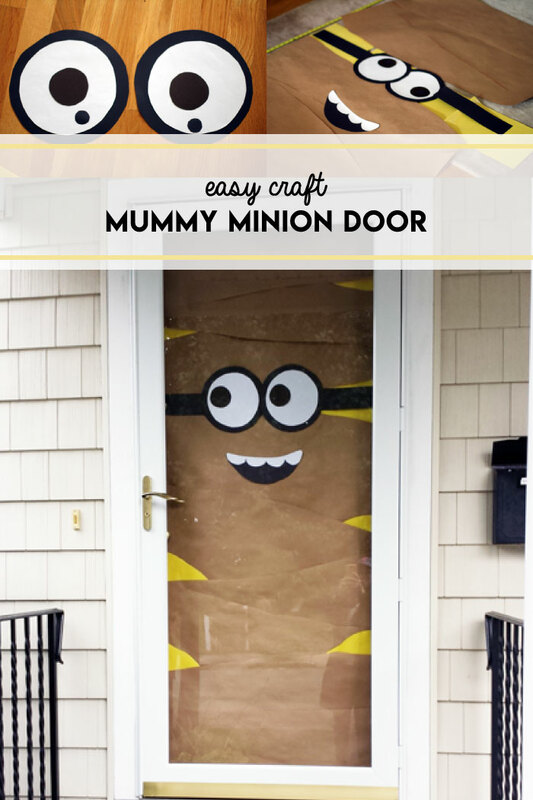 Hang and tape the mummy to the front door using packing tape around the edges and sides so as not to pull off any door paint. Tape on the eyes and eyeglasses. We did this last to see how things would align with the deadbolt and it turned out we needed to cut one of the eyeglass stems to fit around the deadbolt. So cute, no? Let me know if you have questions! And now I'm thinking a couple of minion pumpkins will look super cute alongside the door!